I recently was going through some old scrapbook pictures that also ended up being scanned and posted to my Facebook page. This was done back in that early period when middle-aged people ruined social media sites by invading what up to that point had been the province of teenagers and early twenty-somethings only. I don’t have children, but I plainly recall of the horror that my own nieces and nephews suffered when their parents joined the party. Kids had to suddenly contend with embarrassing photographs and status updates posted by their parents, and there was very little they could do to prevent it other than attempting to at least block the content from their own friends. My own contribution to this collateral damage was pretty much inflicted on myself only. I received e-invites from a small circle of ancient acquaintances, and at some point I finally joined Facebook and began loading old pictures of myself. 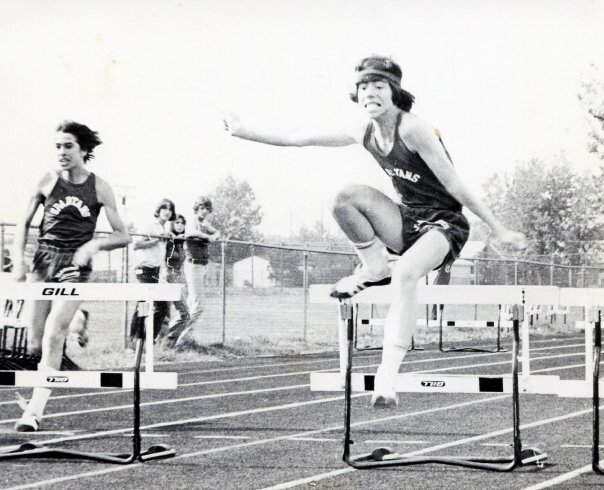 The above picture is your humble blogger circa 1975 running in a hurdles race. The form is all wrong — hands and arms should be hugging my waist, the body should be in a downward arched slope, and I shouldn’t be twisting like a pretzel. Yet, for all of my problems I actually won races. Trying out for the track team was probably the safest choice for me. Unlike the more glamorous sports like football or basketball, track coaches never actually cut anyone from the roster. You simply made the team by virtue of going to practice each day. Even if you ran in the second or third heat of a race, you were still competing and not sitting on a bench watching. Track and field was about as egalitarian an opportunity in sports that I was going to find back then. Prior to running, I hadn’t really discovered any extracurricular school activities. I had no acumen for foreign languages, I was at best an average student only, and my athletic abilities were also quite average. I wasn’t big or tough enough for football; I lacked the required coordination and grace needed for basketball; baseball I loved (and still do) but not only did I lack power, I was also afraid of the ball hitting me if I played the infield. Perhaps because I had successfully run from so many near-altercations with schoolyard bullies in my young life, track and field ultimately provided me with the one chance for athletic success. Whatever I lacked in grace and agility, I could at least make up for it with speed. Wanna see me run like the wind? Threaten me with bodily harm. A very kind coach — Coach Dave — spent hours with me going over running form and style. He had me watch films of runners such as Bob Hayes, Willie Davenport, and Edwin Moses. We had no VCR’s, DVD’s, or YouTube back then. It was just an eight millimeter movie projector that was aimed on a blank wall in an unused wrestling room. I would watch the films carefully, looking for any tip from these legends that I might be able to incorporate into my own sorry approach. 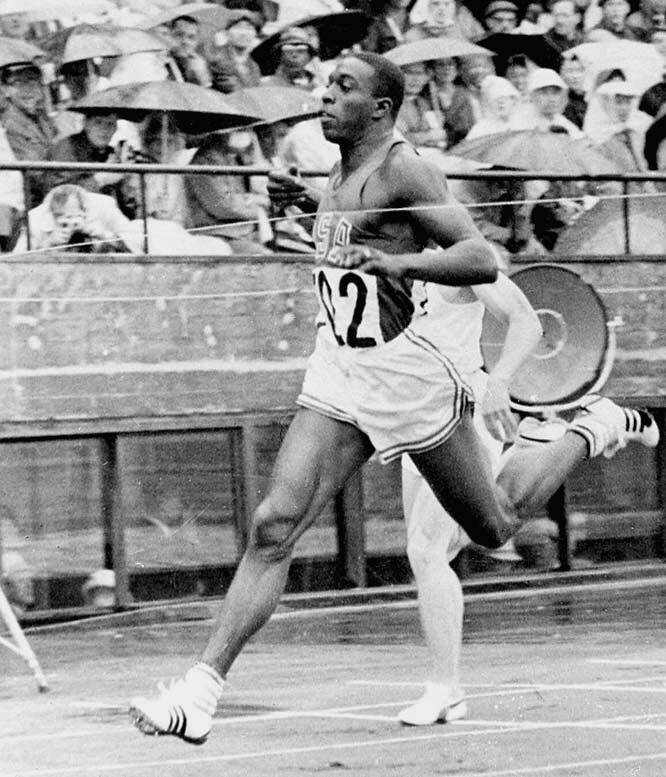 If you could ignore that I was a skinny runt who had absolutely no muscles or an intimidating presence, the resemblance that I had to Bob Hayes was simply uncanny. Or so I believed. Coach Dave used every psychological trick in the book to make me believe that I was better than I was. The good coach gave me confidence to be better than I truly deserved to be. In time I actually exceeded expectations by winning a number of races. Although I ran the 100 and 220 yard sprints, I specialized in the hurdles because he figured that I’d have a better shot against the faster and more muscular football players who would sloppily leap over each hurdle (and quite often win). In time I finally developed a little style and form into my running. I grew up in a very white upper-middle class suburban community of Detroit. There were absolutely no African-Americans that attended my school, and to my knowledge there were none at the other two high schools in our town either. Our athletic conference, however, did include the city of Pontiac, which was located in the northern reaches of the county. Pontiac had (and continues to have) a very large black population, and Pontiac Northern was always the toughest opponent on our schedule. Whatever achievements I had achieved prior to our meet with Northern, they were all forgotten by the time we traveled there for our scheduled competition. Sure enough, my team lost every single sprint and hurdle race that day. In my own races, I didn’t even garner a third place showing. But what I’ll never forget after running the 330 yard low hurdles, was the kindness shown to me by one of the Pontiac runners who had beaten me. Instead of just giving me the perfunctory hand-pump at the end of the race, I recall his taking me aside to both compliment me and offer some tips on my hurdling form. When I later saw him at the conference championships at the end of the season, we greeted each other like old pals. In our own very tiny way, we were reaching across racial lines. It wasn’t much, but we were both making a positive statement of some kind. When I entered college, I made an attempt to join the university track team. Knowing I would never make it anymore as a sprinter, I worked out with the middle-distance runners in an attempt to emulate my hero Edwin Moses with the 400 meter hurdles. After several weeks of indoor practice during the fall and winter months, I increasingly found myself in the trainers room having my sore knees bandaged before and after workouts. Finally one day when the medics determined that the pain I was experiencing was from a fluid build-up, the coach came up to me and kindly wished me a very good academic career and life thereafter. My collegiate athletic career was over before it even began. In later years I tried jogging but soon felt that old familiar pain coming from my knees. Tennis appeared to be the safer, occasional sport. The elliptical and the stationary bike are my friends in the gym because they are kind to my body. Watching the Olympics every four years is an even safer activity, and that’s one that actually allows for a beer to be consumed with it. As we used to say in school, you don’t have to be a jock to be an athletic supporter. To the extent that I really even get on Facebook anymore, the lion share of my photos are friends, family, and former work colleagues. The number of pictures of my track and field achievements are appropriate to the role in which they actually played in my life — very little. I long ago tossed the medals and ribbons that I earned. The memories are faded ones, and the glories thankfully not exaggerated. I’ll leave all of that for others who might actually deserve to brag about the winning touchdown toss, or the basket that was sunk in the last second. For me, I’ll stick with just the few pictures. 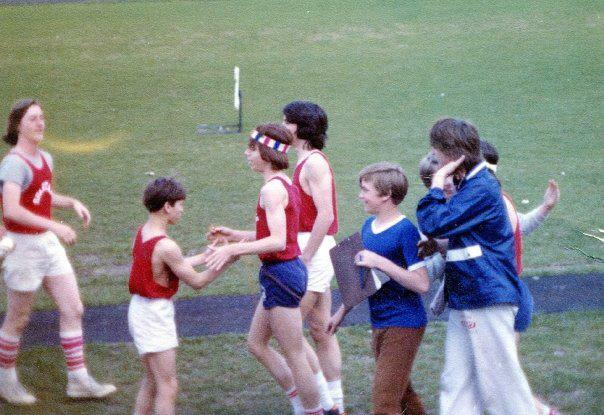 That’s me in the cool bicentennial headband after a victory in the 100 yard hurdles. Joe, whoa, I don’t recall that term, but I do get it. How we ran with those short-shorts is beyond me. That must have been an east-coat term? Joe– I believe it was 10.6, which would have been a GREAT time if it had been meters instead of yards! I’d have given anything back then to have seen those bands in their prime. Thanks for reading!